Just when you thought it was time to throw out your favorite tube socks from your high school soccer days, think again. Sportswear is in! 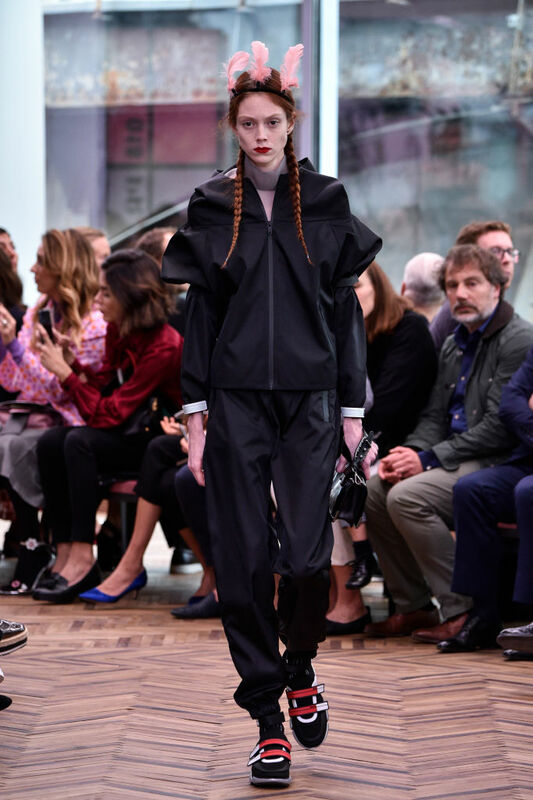 And if you’re wondering how slouchy tracksuits, sports knits, and shin-protecting soccer socks could possibly be high-fashion, Prada‘s resort 2018 collection has got you covered! Juxtaposing sporty shapes and materials with ultra-feminine accents, such as crystal beading, maribou feathers, and pink and peachy shades, cutting-edge fashion designer Miuccia Prada’s latest collection — shown this weekend in Milan — is what we imagine would be brought into being if Sporty Spice and Posh Spice had a fashion baby. …and plumed mini-skirts matched with sneakers that can take you from runway to running full-out in no time flat! Also. This tracksuit with feathered headband and black leather handbag? Perfection. But the collection’s most winning look is this chic, athletic sock-inspired footwear and high heel combo! When asked about the inspiration behind the collection, Prada told Women’s Wear Daily the goal was to achieve elegance through sports and visa versa. “I love transparency at the moment. Sometimes I work with something I don’t like but this actually, I like. I don’t know why, [because] it’s a naked body but it’s also [delicate], and underlined by sports. Both are an obsession for the body, both are interested in the body,” said Prada. Looks like for Team Prada, 2018 shaping up to be a great season!